One of the first reading lessons I start with is having my students bring in their favorite book. 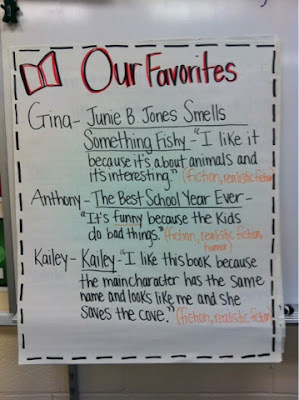 Each student shares their favorite book with the class and tells why it's their favorite. In this brief time I am able to gather information about my students' interests and level of reading they choose to read. During this meeting on the carpet I was able to introduce the importance of underlining a book title, the use of quotation marks, and identifying genres. After everyone shared, I asked the students what they learned. I thought they would reply...underline the title of a book, use quotation marks when someone is talking, etc. Surprisingly, the students made some deep connections within our class. Their responses showed more depth of knowledge than I anticipated﻿: "No one picked non-fiction as their favorite book," "A lot of kids in our class like series books," and "A lot of students like realistic fiction." Their responses reflected the class as a "whole" and not individual observations. I felt like a proud mama!!! On the second day of school we were already forming our class family and reading community. Not only did the students learn something new, so did I! This informal "assessment﻿" will drive my future reading plans. Without any "test" I know that my students need more exposure to non-fiction reading material and need to be guided toward more challenging reading choices. Sharing our favorite books with each other exploded into an excellent learning opportunity for everyone. Now my students know a little more about each other and their reading interests, which will help later when forming literature circles and/or reading partners. What a great idea!! I will definitely be using this lesson in the future. I'm going to do this next week with my students! What a wonderful idea! Susan Kelleher here! I'm the one whom is going to use this idea next week! Thanks Joanne for sharing your ideas and excellent teaching skills! Love this idea. 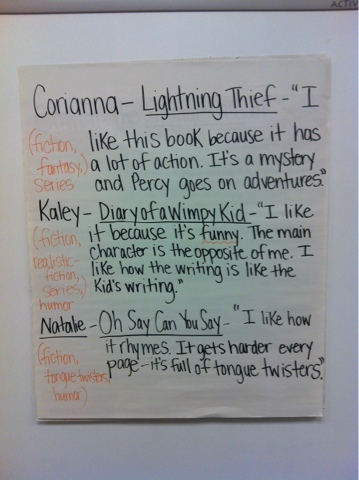 Great way to immerse the students into reading and encouraging them to challenge themselves.